Wannabe Wordless Weekend | T.O.T.E. ← Labor Day Hike and Num-Nums! This would be a post like any other Monday post. You know, lots of pictures. No words. However, I am sorry to say, I did not pick up my camera once this weekend! Thank goodness Andy worships at temple Apple and has one of their fancy pants phones. I have several photos from his phone for you, and one fabulous video! Yay for figuring out how to embed youtube videos! I saw this fuzzy little guy eating pepper leaves later. He was promptly relocated! 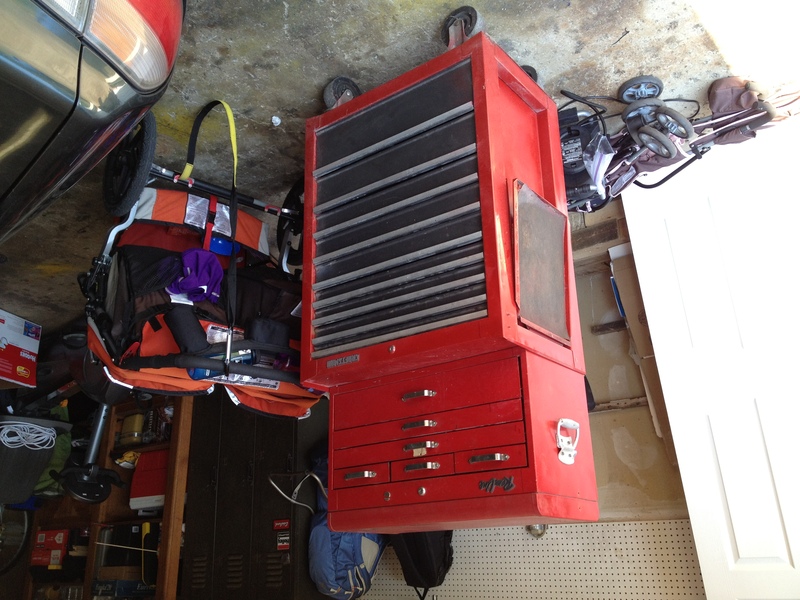 An older gentleman was selling this craftsman tool chest (full of tools) for a ridiculously low price (“I’ve got another set in Arizona,” he said). We snagged it! How did we get it home you might ask? Well, that’s an interesting question. You can see the edge of our little Honda in this photo. It happens to be full of car seats and kid paraphernalia, and I’m not sure it would have fit anyway. So, Andy pushed his new-to-us tool chest home! We’re still trying to figure out what the mystery squash is. The one that’s pulling down the trellis. Mo and Lu helped Andy cut this one down because it was growing behind the trellis (Andy was the one using the knife, don’t worry). 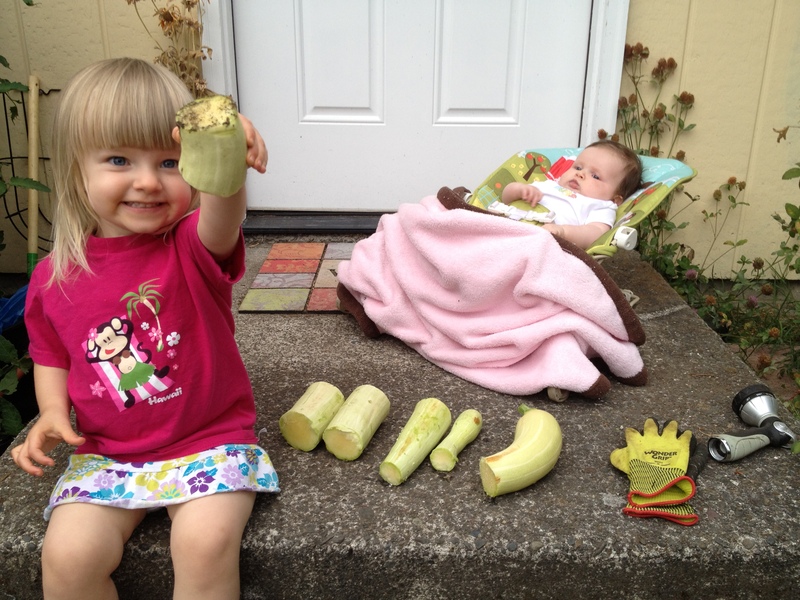 It was very soft, inside and out…Now I’m thinking it’s some sort of zucchini? Nikki, I still need your help! I will leave you with this video of Mo shakin’ it! I promise I didn’t show her any of those moves. They come from her soul. My favorite aspect of this video is the baby wearing. As soon as I tied my skirt around her front, she insisted on putting a baby in there. Just like I do with Lucia. (By the way, Lu’s official Mo-name is “Bia,” *shrug* I’m just glad Mo calls her something other than “Baby”). We need to find this kid a dance class, stat! 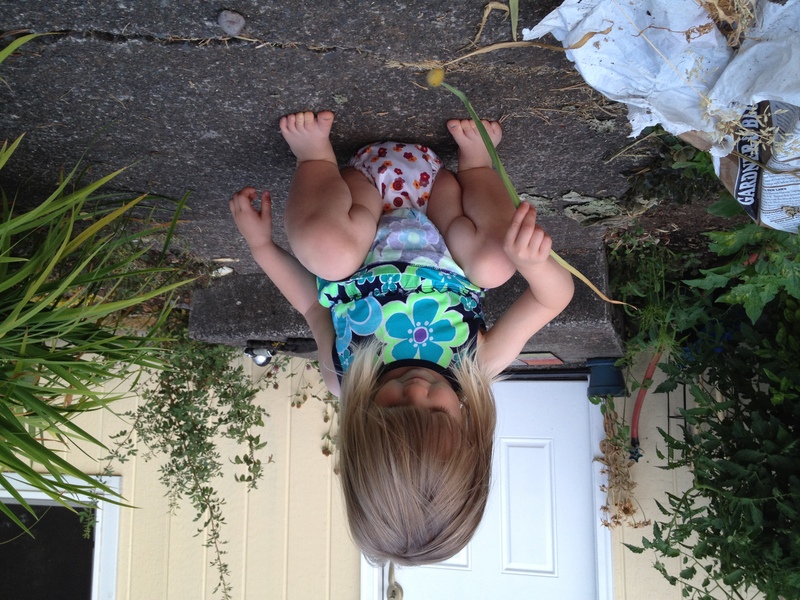 This entry was posted in Uncategorized and tagged Garden, iPhone, Lu Pic, Mo Pic, Video, Wordless Weekend. Bookmark the permalink. Mo is so very cute and has a great sense of rhythm. Dance class for sure, as long as they don’t squelch her free spirit! Shake it Mo!! That skirt was the best idea ever…I wonder who gave it to you?